Construction on the Walnut Place handicap improvements are under way. Morrow County officials held a brief ceremony Wednesday morning. MOUNT GILEAD — Construction on the Walnut Place handicap improvements are under way as Morrow County Commissioners Chairman Tom Whiston signed the notice to proceed for Hinkle Builders on Wednesday. The Morrow County Development Office administers the County’s CDBG allocation fund. The Walnut Place, also known as the Morrow County Administration Building, has not always been the easiest for residents to access. 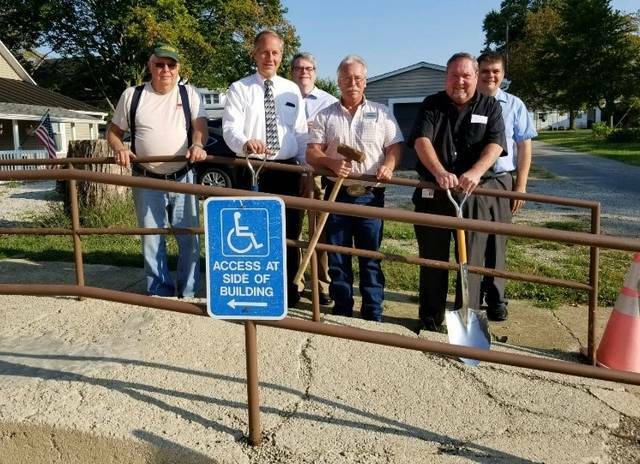 The new handicap improvements will increase accessibility to the building with a new ramp installation to the rear entrance, as well as interior modifications. Construction will begin in October with a deadline for completion of Dec. 1, 2017. The allocation grant is providing 75 percent of the funding. The Community Development Block Grant Program is administered by the Office of Community Development and provides federal funding to communities to address a variety of needs. Funding for Morrow County communities target community development, housing, public facilities, emergency shelter and special projects and activities that do not fit within the structure of existing programs and to provide supplemental resources to resolve immediate and unforeseen needs. “We would like to welcome everyone to visit the commissioner’s office once the improvements are completed,” Whiston said. https://www.morrowcountysentinel.com/wp-content/uploads/sites/29/2017/09/web1_Walnut-Place-Groundbreaking.jpgConstruction on the Walnut Place handicap improvements are under way. Morrow County officials held a brief ceremony Wednesday morning.